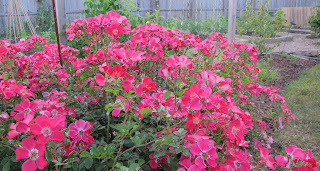 Welcome to Garden Bloggers' Bloom Day for June 2012. 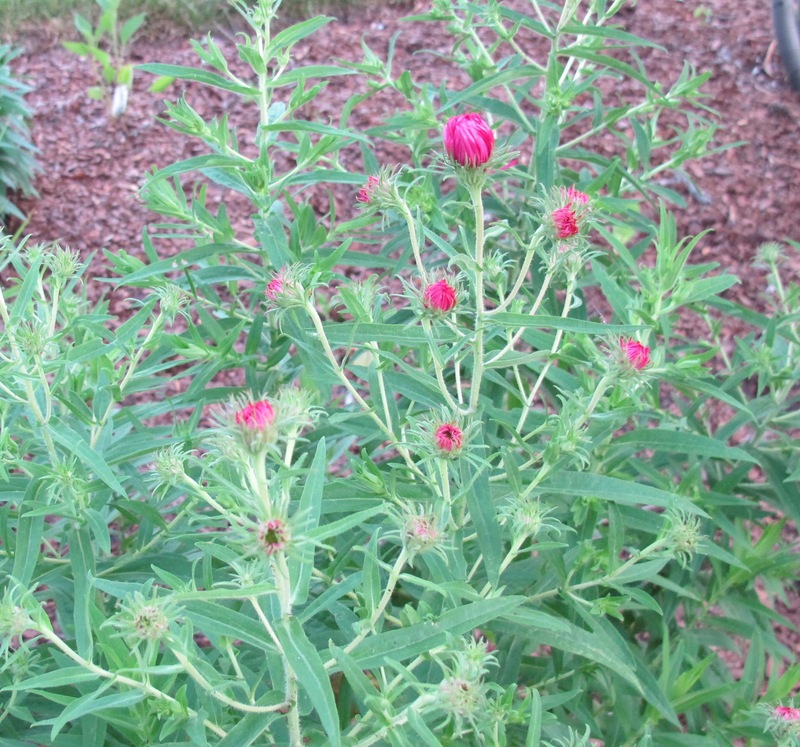 As I looked around my USDA hardiness zone 6a garden early yesterday morning, before the sun was bright, I was surprised to see how many red and red-toned flowers I have in bloom. There was a time when I could never have imagined that red would ever be that prevalent in my garden, especially in June. But times change and so does a gardener's willingness to expand the color palette of her garden. In Plopper's Field, so named because it is where I just plop plants in wherever there is a bare spot, a new bloom of Hemerocallis 'Longstocking' , purchased from nearby Soules Garden, brings some red to that border. Just down the way, on the edge of The Shrubbery, a mass of shrub roses immediately draws my eyes to the area, and I think briefly about sitting for a spell in the garden before heading off to work. But I keep going on past the roses, past the gate to the vegetable garden and find some yarrow casting a reddish glow on the day. I moved these plants at least three times while re-doing the garden. I think I've found them a good home now and will just leave them be for awhile. The yarrow watch over the beginning of the path I call Ridgewood Avenue that divides Woodland Follies from August Dreams Gardens. Here I stop, surprised to see an aster starting blooming. This aster is supposed to bloom in late August and early fall. What cue did it get that made it think that now was the time to bloom? I guess I shouldn't really be that surprised. This has been a mixed up season so far this year. Elsehwere in August Dreams Garden, sneezeweed is starting to bloom, too. It's just a happy coincidence that the blooms of the sneezeweed match part of the sculpture in that garden. Of course, all is not red in my garden in June. The shasta daisies, coneflowers, and coreopsis bring white, purple and yellow to Ploppers' Field. In front there are pink blooms on spirea and yellow blooms on roses, mixed with the hint of blue on newly planted butterfly bushes. Much of the garden is the same as it was on previous bloom days in June in 2007, 2008, 2009, 2010, and 2011, give or take by a few weeks and give or take a few new plants each year. But red is the color I see in my garden today, in 2012, in the middle of June. We would love to have you join in for Garden Bloggers’ Bloom Day and show us. Your picture of yarrow is stunning. This is my very first year to give it a try... Thanks for Hosting GBBD! Your Hemerocallis 'Longstocking'is gorgeous! I love red flowers too, I once tried to make a whole flower bed with just red flowers, but found it impossible to find proper red flowers, many of them turned out to be more purple or pink despite being called red on the label. Thanks for hosting the GBBD again, I look so forward to joining in every month! I love your red flowers! Thank you for hosting! I love the veritable sheet of yarrow blooms. I have been thinking about my color palette and at some point, might need to tear out all the pinks and blues. 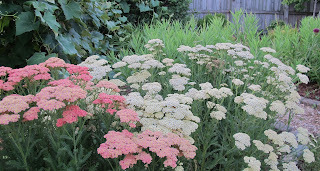 Yarrow is a favorite in my garden. I really like your combination of colors. Red is in my garden, and as I ponder, it makes quite a statement. The roses are red, most of them. Some of the yarrow is red. Some of the lilies are red. Your reds are lovely and really stand out. Thank you very much for hosting. Lots of warm colors this month...signaling that the summer heat will soon arrive? Have a beautiful Bloom Day, and thanks again for hosting this great meme. I love the yarrow! I've honestly never planted those colors and in such as mass--it's just lovely! Thanks so much for hosting GBBD! Cheers! 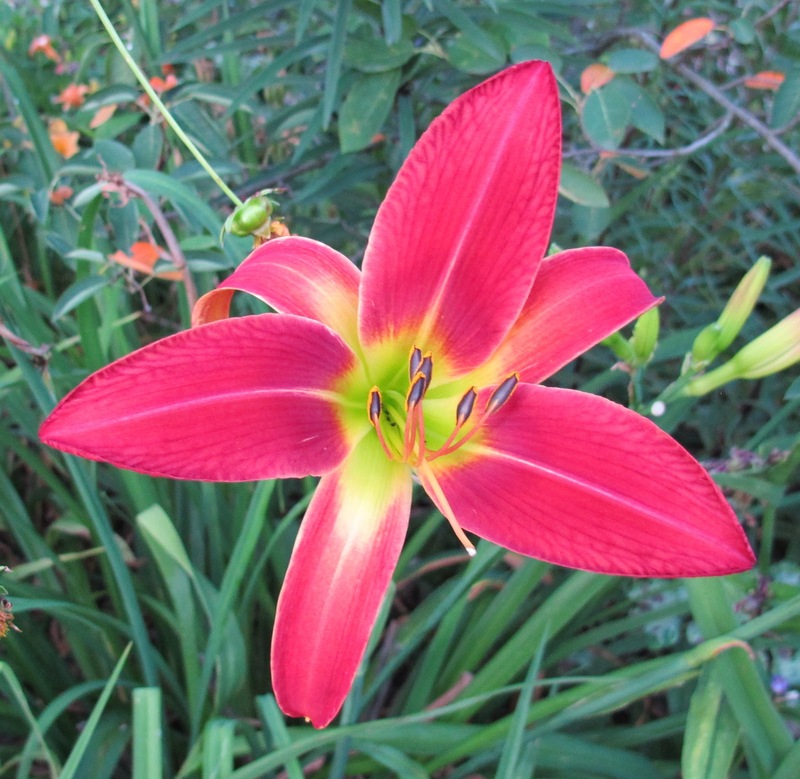 Love the red daylily Carol. It's definitely been a mixed-up season in the garden with so many things blooming early. Wonder what will be left to bloom in late summer and early fall! Thank you for hosting Bloom Day. I think the reds and orange are the perennial colors of the hot tropics. It has always been here in our landscapes, that sometimes you get tired of them. I actually long for blues and deep violets, but they are not very common here, i wonder what is the relationship of colors with temperatures. I remember that in editing photos, we slide the rates to warmer and more reds show, for opposite to the left means we go to colder blues. Oh i have to study that later! But i love the blues and deep purples, and they are all in your temperate climates! hahaha! I´m surprised too, "Alma Poetschke", that early!!! I love red, nice to see this wonderfull colour in your garden! Love your mix of blooms. The Hemerocallis 'Longstocking' is striking! Thank you for hosting GBBD and Happy Gardening! Love the picture of Cherry Pie. Have never seen it before. Lovely! Wowee, how about that Aster blooming in June ? Things are a bit off here on the left coast too.Happy Bloomday to you ! Red...how odd, since that is the color I'm starting to see here...not since April. That daylily is stunning, and then some...hmmm, more ideas. How coincidental, my GBBD post is about whether one is a plopper or a planner in the garden. I love all the red. Thank you for hosting! Looks like red is the prevalent colour this summer. It is pink in mine - roses, torch ginger, bougainvillea, hibiscus. Happy GBBD to everyone and thank you for hosting! Hi I love the idea of a garden blogggers bloom day, each month. You have many beautiful flowers in your garden. You've inspired me! Love your rose! In my garden right now it's all pinks and blues with foxgloves and roses. But the summer blooms are just starting to peek out, so there's hints of bright colors to come. If this continues, then red may become a regular feature in my garden! I love the colours in your June garden, but I might be a bit prejudiced because red is my favourite colour and I have lots of it in my own garden. I especially love your gorgeous day lily. Have a great GBBD! Although Asiatic lilies and day lilies are in full bloom in upstate NY, mine are still in bud (except for an Asiatic lily I just bought). I love your unintentional color scheme. Our columbine is just finishing up and I was able to get a picture of the last two flowers. Happy GBBD and thanks again for hosting this. Lovely photos again this month! As a former New Orleanian I am in love with your Helenium 'Mardi Gras'. Thanks for hosting GBBD! Lots of pretty reds blooming for you now. Red has crept into my garden as well, Carol, and it is just as surprising as in yours. Red draws the eye and plays well with others. Happy Garden Bloggers Bloom Day! 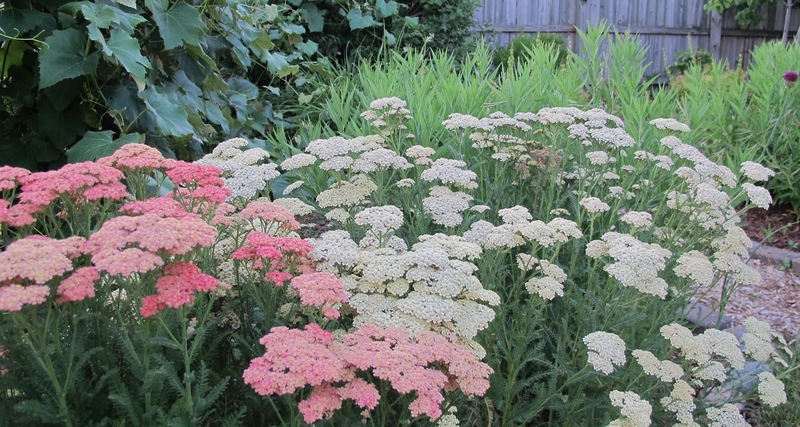 it's been said above, but I love the different shades of the yarrow. So interesting how over time we become more prepared to expand our colour palettes - I haven't quite accepted pillar box red yet but no doubt the day will come. Now those are rose blooms! Your the host with the most! happy gbbd. I really like H 'Longstocking'... new to me today. Thanks Carol! I enjoyed your focus on red plants this month, Carol - they are a vibrant start to the summer season. Thanks for hosting bloom day! There are some lovely red and orange shades now available in the Achillea. I've grown them for cutting on my allotment and they grow fast and flower over most of the summer. If you're going down the red route they're worth a look. I love red and pink flowers. So much beautiful red is surprising in the spring. Just beautiful. I see red, burgundy and orange, but mostly I see green, lots and lots of green. Thank you for hosting another Garden Bloggers Bloom Day, your efforts are appreciated. I have always thought the same about red. It would never hve been a chosen color int he past. However, I am happy to have red in my Texas garden. If a flower blooms here it stays. Longstocking si a bloom I would enjoy too and the yarrow is a favorite. Happy Bloom day Carol. Yes, sit a while and enjoy. There's very little red in my garden just now with the exception of red/burgundy foliage. It's mostly blues and purples for midsummer while I usually have the reds for late summer colour. Thanks again, Carol. I so appreciate being able to chronicle what's happening in my garden and reading about others. I too love a little red puch in the garden! ....and am also seeing lots of things blooming far ahead of schedule, hope GBBD in September finds us with something left to take photos of! That's a gorgeous daylily! I love daylilies, but only a few yellow ones have started to bloom in my more northern garden. The Corpse Flower only blooms for a few days. These are VERY rare and it may be a while before you see another. Yes, the season seems mixed up. We normally don't have the main flush of daylilies until around July 4. I enjoyed seeing your blooms. I love that you have a theme. All very lovely reds! Enjoy your day. Right now, pink & purple seem to me my most dominant color in the garden. There isn't much red. Thanks for hosting. I'm having a good time seeing what everybody's garden looks like. Thanks for hosting GBBD - this is always so much fun! This is a great time of year where everyone has such interesting plants in bloom. I love the reds and pinks in your garden. Very pretty!! My garden this time of year is dominated by many shades of purple and blue from my many Spiderworts. My Asiatic Lilies bloomed just in time. They are amazing. Beautiful mass of yarrow! Love your reds and pinks. It's funny how our "signature" garden colors shift over the years; never thought maroon would play such a big part in my yard. Happy bloom day! Love those yarrows ... beautiful! My garden has not reached its red "hot" phase yet. I am still in the purple/blue and yellow phase. I have the same feelings about orange, yet more and more of that color seems to be creeping into my garden. The sneezeweed looks perfect next to your red sculpture! Thanks again for hosting this, Carol; I wouldn't miss Bloom Day! So sorry about the double link!! I'm not sure why it autofilled with the wrong post, but I couldn't find an undo button. I love your prevalent red blossoms! It makes me want to plant a color-themed flower garden next year. I love red in the garden. And I love how the colors of a garden changes as the season progresses. That sneezeweed with the sculpture is just perfect! Happy GBBD0 - and thanks for hosting! Look at all those beautiful red blossoms in your garden. The helenium is especially eye catching. Will have to look for that one. So glad you reminded me of the name of those landscape roses in my post, yes, of course, Oso Easy, 'Cherry Pie'! Glad to see you're inclusive of all colors in your garden, I once knew a gardener who was a "yellowist". I planted red, orange and yellow flowering plants but somehow pink has moved in and confused things...that's what I get for buying plants based on foliage and paying no attention to flower color. The shades of red and orange blooms are vibrant hues in your garden in contrast to the green foliage...Happy GBBD! Stunning, gorgeous reds in your garden. As the weather heats up, we need more and more color in our gardens so they don't look faded in the sun. I plant summer pastels and white in the shade. I love the blooms in your garden. The red daylily is stunning. Your Helenium Mardi Gras is one of my favorites. Mine won't bloom for at least another month. Love the matching cirlique garden art. I have a blue and purple one in my front yard which is so fun. Happy GBBD! My yarrow is about to bloom. This is the first year in the three years I've had it that the woodchucks haven't eaten it! Last spring I planted some geum Mrs. Bradshaw, and that has brought some red into my garden. 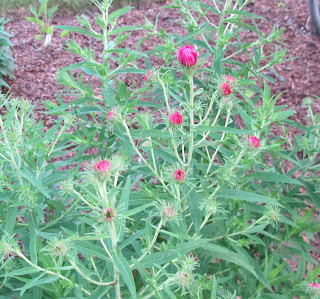 I like it,especially next to the warm yellow coreopsis, but it doesn't play well with all of the pink I have. I may have to find somewhere else for it to live. if you decide to wander along the ridgewood avenue near me, please let me know...would be fun to see you again. thanks for hosting bloom day! That yarrow is beautiful. Another one on my list. And, I think the deer will leave it alone. I can't believe your Helenium is blooming! I pinch mine back like crazy to try to keep from having to stake them. What are you going to have in August??!! Are you worried? Could this be a conspiracy perpetrated by your garden fairies to plant more plants? I am jealous of your yarrow, mine is very lazy and is laying down on the job! Hence it didn't make it into my blog. Mine is definitely a Hydrangea moment this month! Even with the lack of rain, although not for the lack of watering, just ask the water company, they look stunning. Happy GBBD! Your longstocking flower is stunning. I love the photo of the helenium w the sculpture. Also H. Longstanding is a real beauty. I only have one day lily in my garden but I'm going to look for this one. I have a lot of purple tones in my June bloom and one fabulous pink too. Thank you so much for hosting another fun GBBD! Love your reds. Your description of Ploppers field sounds like my whole garden. Pretty crazy year for gardeners with Alma P. blooming in June! You've got much more happening in your garden than in mine, though my Asiatic lilies are about to bloom in the next few days. My GBBD post is now up. Thanks for hosting! Your Yarrow is beautiful. I've not had good luck with it. I'm amazed at your Helenium in bloom. Mine will be several months yet, I think. This month I have an assortment in the garden, but seeing as it's June, I am giving the (mostly inherited) roses a bit more exposure than I usually grant them. This is SO fun--thanks for hosting! I have a lot of purple flowers in the spring and move into hotter colors of red and yellow later in the Summer. The mulching is done and you can come visit now! Hope you are doing well and your garden looks great! Thanks again for hosting another blooms day. Red is my favorite flower color! Lovely blooms, Carol, and all so far ahead of things in my garden. I am featuring roses this time since I'm so happy they are finally blooming. Not much blooming as we head into the hot Summer months, but a few things to catch my eye including some understated but lovely acanthus. Happy Bloom Day! I see I'm not the only one with confused plants this June. Although I'm not a fan of orange, I must say that Helenium looks smashing with the new scultpure. Happy Bloom Day, love seeing the different areas of the country and how many blooms are already open. My Helenium is just now starting to open and yours is in full glory! Thanks for hosting, Carol! This is my first Bloom Day and hope to be able to participate regularly going forward. I really like the 'Longstocking' Daylily, very unusual. I seem to be adding more and more red to my garden. I think it all started when I added the 'Don Juan' red climbing rose to the garden. Happy Bloom Day and thanks for hosting! This is my first year in a new garden, and I hope readers can help me identify some of the plants. Stop by and help! I don't have very many red flowers in the garden - the backdrop of my house gives quite enough red to the garden all by itself! Lots of yellow and orange, though, to complement the red. A wonderful bloom day for all! It is interesting to think about the dominant color in the GBBD posting. For us it has to be mostly yellow and red around the yard. Both are eye catching from a distance. I'm realizing I've should have posted the Blackout Lilies which, though they have been out for weeks now, still compete for attention in the yard. There is so much happening right now. It's my first bloom day ever! I do have some red, but I love the different shades of red you have. Hopefully I'll see my garden grow as much as yours has over the years... Thanks for hosting! Garden Bloggers Bloom Day was gorgeous here: perfect weather to be in the garden. I look forward to exploring some of the posts. Asters and sneezeweed already? Love that curly/wood shavings thingy. Happy BD, Carol! It's interesting to see that there are some plants even out in the USA that are getting confused as what time of the season it is. I'm not sure whether I'm comforted by it or even more concerned! I love the color of that daylily, Carol. Luscious. Love the name 'Plopper's Field'! I seem to have a red, white and blue theme at the moment - unintentional but fitting for the Royal Jubilee. thanks for hosting! I've only just started garden blogging so i appreciate getting to come here and find a giant list of garden blogs to peruse. cheers! 'Alma Potschke' in June? Your garden must be as confused as mine, where I have columbine blooming alongside tall garden phlox and mums. As I'm snapping pictures around the yard, I'm realizing that my dominant color is definitely yellow! At least for this month!